Cheers erupted in a memorial centre for victims of the Srebrenica massacre on Wednesday as a UN court convicted ex-Bosnian Serb commander Ratko Mladic of genocide and crimes against humanity and sentenced him to life in prison. 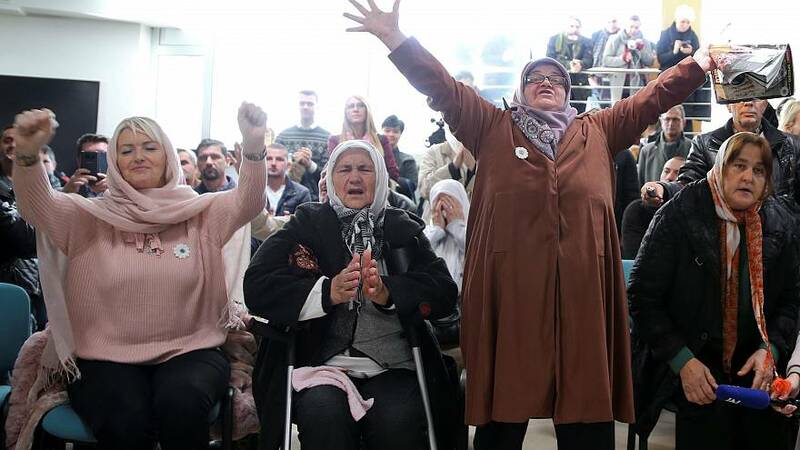 The wives, sisters and mothers of the mostly male victims of the 1995 massacre had closely followed the hearing of the UN International Criminal Tribunal for the Former Yugoslavia (ICTY) on TV and some broke into tears of joy when the verdict was delivered. The ICTY found Mladic guilty of 10 of 11 charges, including the slaughter of 8,000 Muslim men and boys at Srebrenica and the siege of the Bosnian capital Sarajevo, in which more than 11,000 civilians were killed by shelling and sniper fire over 43 months. “The crimes committed rank among the most heinous known to humankind, and include genocide and extermination as a crime against humanity,” Presiding Judge Alphons Orie said in reading out a summary of the judgment. “Many of these men and boys were cursed, insulted, threatened, forced to sing Serb songs and beaten while awaiting their execution,” he said. Mladic had pleaded not guilty to all charges and his legal team said he would appeal against his conviction. Srebrenica was once known for its metal plant and nearby lead, zinc and gold mines. These days, the main landmark is the Potocari memorial on its outskirts, where more than 6,500 white tombstones mark the remains of the victims that authorities have managed to find. The unarmed men and boys were separated from the women and rounded up to be shot in what amounted to Europe’s worst atrocity since World War Two. In its summary, the UN tribunal found Mladic “significantly contributed” to the Srebrenica genocide with the goal of destroying its Muslim population, “personally directed” the long bombardment of Sarajevo and was part of a “joint criminal enterprise” intending to purge Muslims and Croats from Bosnia.